On a short week, the Seattle Seahawks traveled to Silicon Valley taking care of business with a sound thrashing of the 49ers 20-3. In what had been one of the most fun rivalries in all the NFL, what we saw was the Hawks was akin to the bully on the block giving the new kid a swirly. The hotly contested rivalry between Coaches Pete Carroll and Jim Harbaugh has been muted. With the evil genius Harbaugh at Michigan, the much maligned Jim Tomsula steers a rudderless ship. The beat down was so sad that with on fourth down, with 5 minutes left on the clock, Tomsula elected to punt rather than go for it; down by 17, the 49ers basically threw in the towel. Even Corner Back Richard Sherman no longer views this as the rivalry it once was. The Seahawks defense which had been MIA for most of the season threw a shut out in the 1st half, and only gave up a field goal in the 2nd. Most impressively, the Seahawks fourth quarter defensive meltdowns failed to rear its ugly head. The Hawks defense forced 9 punts while surrendering a meager 8 first downs. Six sacks were recording by the Seahawks including 3.5 by Defensive Lineman Micheal Bennett. As well, the stout defense limited the 49ers to a mere 142 total yards. 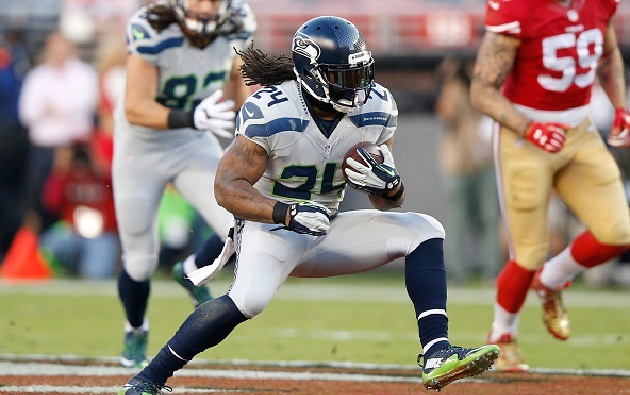 On the ground, Beast Mode (Running Back Marshawn Lynch) was the workhorse with 27 carries for 122 yards. In the air, Russell Wilson struggled giving up 2 interceptions and taking 5 sacks. However, just before halftime, it was a 43 yard strike to Rookie Wide Receiver Tyler Lockett that reminded Seahawks fans that this team is not quite yet out of it. This game was the equivalent to a college power house taking on a directional teachers college. This was a game that they were supposed to win and in impressive fashion. The Hawks dug a hole by dropping 4 winnable games . Had they won 2 of the 4, their record would be 5-2 and we would be praising them. But at 3-4, I look at this team with cautious optimism. The defense looked like they should, and more importantly they did not fold when we had the lead. Offensively, I was happy to see Thomas Rawls get some carries, and I enjoyed seeing a healthy distribution of the passing to get everyone involved. I am still a bit concerned with the pass blocking and Russell’s inexplicable interceptions today. But, with a winnable Dallas game ten days from now and a bye after that, we could be looking at a Seahawks team getting healthy at the right time. Defensive Lineman Micheal Bennett was in the backfield all day harassing Colin Kapernick. Bennett registered 3.5 sacks and 5 tackles bolstering a Seahawks defense that resembled the recent Super Bowl runs. The Hawks travel to the Big-D to take on the Dallas Cowboys in Arlington. Thats the Hawks we know and love!! !